More acts have been revealed for the 2016 Download Festival, at Castle Donington in the UK. The festival will take place June 10-12, and the newly announced acts include: All Time Low, The Temperance Movement, The Wildhearts, Napalm Death, Pennywise, Glassjaw, Scorpion Child, Royal Republic Buck & Evans, Scattering Ashes, Wierds, Devil You Know, The Raven Age, and The Shrine. Previously announced acts include: Alien Ant Farm, Amon Amarth, Anti Flag, Architects, As Lions, Ashestoangels, Atreyu, Attila, Beartooth, Billy Talent, Black Foxxes, Black Peaks, Black Sabbath, Breaking Benjamin, Bury Tomorrow, Cane Hill, Counting Days, Danko Jones, Dead!, Deftones, Delain, Disturbed, Don Broco, Down, Electric Wizard, Escape The Fate, Fort Hope, Frank Carter & The Rattlesnakes, Ghost, Gojira, Good Tiger, Grand Magus, Graveyard, Gutterdamerung, Halestorm, Havoc, Heck, Hill Valley High, HO99O9, Iron Maiden, Janes’s Addiction, Kadavar, Killswitch Engage, Korn, Lawnmower Deth, Megadeth, Milk Teeth, Monster Truck, Muncie Girls, Municipal Waste, Neck Deep, Nightwish, NOFX, One Ok Rock, Palisades, Periphery, Rammstein, Reigning Days, Rival Sons, Saxon, Shinedown, Shvpes, Sixx: A.M., Skillet, Skindred, Slaves, Strange Bones, TesseracT, The Amity Affliction, The Kenneths, The King Is Blind, Tremonti, Turbowolf, Twin Atlantic, Wage War, Whiskey Myers, and Zoax.. In other news, the organizers are now calling the main stage the “Lemmy Stage” in honor of Lemmy Kilmister, and are planning a Motörhead tribute. More acts have been revealed for the 2016 Download Festival, at Castle Donington in the UK. The festival will take place June 10-12, and the current lineup includes: Alien Ant Farm, Amon Amarth, Anti Flag, Architects, As Lions, Ashestoangels, Atreyu, Attila, Beartooth, Billy Talent, Black Foxxes, Black Peaks, Black Sabbath, Breaking Benjamin, Bury Tomorrow, Cane Hill, Counting Days, Danko Jones, Dead!, Deftones, Delain, Disturbed, Don Broco, Down, Electric Wizard, Escape The Fate, Fort Hope, Frank Carter & The Rattlesnakes, Ghost, Gojira, Good Tiger, Grand Magus, Graveyard, Gutterdamerung, Halestorm, Havoc, Heck, Hill Valley High, HO99O9, Iron Maiden, Janes’s Addiction, Kadavar, Killswitch Engage, Korn, Lawnmower Deth, Megadeth, Milk Teeth, Monster Truck, Muncie Girls, Municipal Waste, Neck Deep, Nightwish, NOFX, One Ok Rock, Palisades, Periphery, Rammstein, Reigning Days, Rival Sons, Saxon, Shinedown, Shvpes, Sixx: A.M., Skillet, Skindred, Slaves, Strange Bones, TesseracT, The Amity Affliction, The Kenneths, The King Is Blind, Tremonti, Turbowolf, Twin Atlantic, Wage War, Whiskey Myers, and Zoax.. In other news, the organizers are now calling the main stage the “Lemmy Stage” in honor of Lemmy Kilmister, and are planning a Motörhead tribute. Death From Above 1979, Eagles Of Death Metal, and Turbowolf have announce a 2016 Canadian tour. Check out the dates below. The lineup has been revealed for the 2016 Northern Invasion Festival. 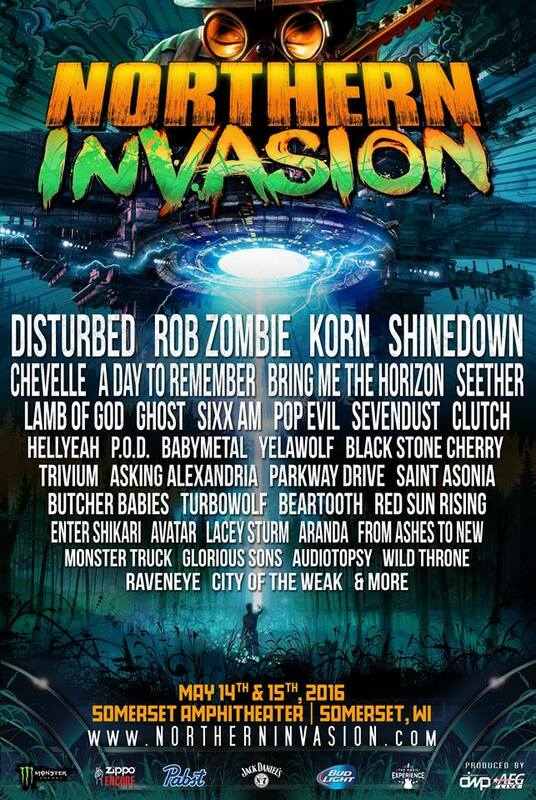 It will take place at the Somerset Amphitheater in Somerset, WI, on May 14-15, and will include: Disturbed, Rob Zombie, Korn, Shinedown, Chevelle, A Day To Remember, Bring Me The Horizon, Seether, Lamb Of God, Ghost, Sixx:A.M., Pop Evil, Clutch, Sevendust, HELLYEAH, P.O.D., BABYMETAL, Black Stone Cherry, Yelawolf, Trivium, Asking Alexandria, Parkway Drive, Saint Asonia, Butcher Babies, Turbowolf, Red Sun Rising, Beartooth, Enter Shikari, Aranda, Lacey Sturm, Avatar, Monster Truck, From Ashes To New, The Glorious Sons, Wild Throne, Audiotopsy, RavenEye, and City Of The Weak. The lineup has been revealed for the 2016 Monster Energy Carolina Rebellion Festival. The event will be held at the Charlotte Motor Speedway in Concord, NC, on May 6-8, and will include: Scorpions, ZZ Top, Lynyrd Skynyrd, 3 Doors Down, Sixx:A.M., Collective Soul, Pop Evil, Between The Buried And Me, Parkway Drive, Black Stone Cherry, HELLYEAH, Sick Puppies, Filter, Candlebox, Aranda, Tyler Brant And The Shakedown, New Years Day, Avatar, Lacey Sturm, Glorious Sons, From Ashes To New, I Prevail, Five Finger Death Punch, Shinedown, A Day To Remember, Lamb Of God, Megadeth Ghost, Anthrax, Bullet For My Valentine, Clutch, Sevendust, P.O.D., The Sword, Escape The Fate, Saint Asonia, Trivium, Wilson, Red Sun Rising, Texas Hippie Coalition, Audiotopsy, Monster Truck, Failure Anthem, Wild Throne, Disturbed, Rob Zombie, Deftones, Alice Cooper, Bring Me The Horizon, Cypress Hill, Pennywise, Yelawolf, Asking Alexandria, The Struts, Babymetal, August Burns Red, Turbowolf, Enter Shikari, Thousand Foot Krutch, Hands Like Houses, Code Orange, and Raveneye.